The Invaluablist's preferred pencil sharpener is the classic hand-cranked planetary sharpener found over the past many decades in just about every classroom in the land. Wonderfully analog and a tactile delight, pencils rate high on the invaluable scale. Pencils are about as simple a means of writing as there is and are unarguably useful and unembellished. Yet, without a pencil sharpener, pencils are rather useless. Although I write with a ballpoint pen quite a bit (working French language drills keeps my cursive from deteriorating), I enjoy using pencils for note-jotting and list-making as I navigate my day. Pencils cannot be beaten for their tactile experience, great cedar aroma when sharpened, and perhaps above all, their erasability. The X-Acto Ranger keeps the Invaluablist's collection of souvenir pencils finely tuned. Pencil sharpeners come in all shapes and sizes. Whereas architects, artists and draftsmen may need a sophisticated pencil sharpener to tailor their pencil points just so, the average civilian pencil pusher mainly just needs a robust, long-lived apparatus that is there when he or she needs it. The pencil sharpener market is saturated with electric designs, distinguished unfavorably from their manual cousins by their complexity and tendency to be made of plastic. The Invaluablist's preferred pencil sharpener is the classic hand-cranked planetary sharpener found over the past many decades in just about every classroom in the land. If you remember the Boston brand from your years of math classes, you will recall it was a market leader. 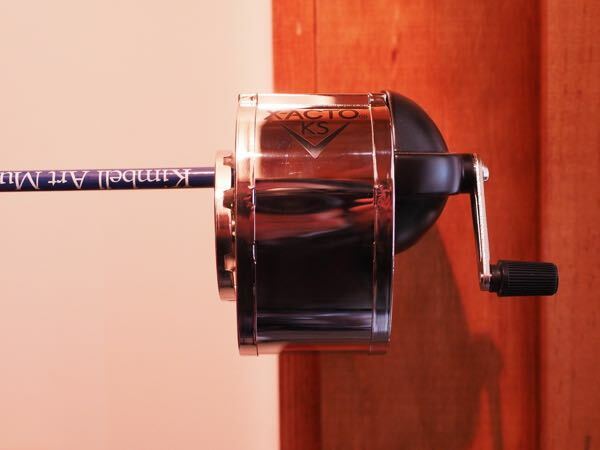 The Boston brand was purchased by hobby-knife masters X-Acto, and now the X-Acto Ranger KS carries on the long quality tradition of the Boston KS pencil sharpener. The X-Acto Ranger may not be the solid, feels-of-one-piece machine of your elementary youth. But it is rather good, and great for its price. Like the Peugeot Pepper Mill, it will not be mistaken for something made with Swiss or German precision. Yet, like the French pepper mill, the Ranger gets right to work when cranked and it tailors pencil points with surprisingly few turns. The Ranger features an appealing egg-shaped chrome steel shavings box. Also, the important sharpening gears and their planetary-gear framework are in steel and aluminum. Perhaps the aluminum base would need to be sturdier for classroom use, but for residential service this overall design should last for years. (Those looking for something more robust might consider the Ranger 55.) Yes, the tiny rotating finger-hold on the Ranger's handle is plastic, but it seems up to the task. Finally, with its eight-size selector dial, the Ranger accommodates multiple pencil diameters. I have a small but growing collection of souvenir pencils from museum gift shops and other attractions and my Ranger is yet to encounter one it could not sharpen. Mount the Ranger KS on the wall, a desk or a table . Every home should have one. The X-Acto Ranger KS is a great gift consideration for any child exhibiting interest in drawing, math or general technical interest. Not a toy per se, but for the right child what could be better for cerebral play than a sharp pencil. Pencil sharpeners are great gifts for adults too, but it takes the right grown-up to appreciate such a useful and thoughtful present.